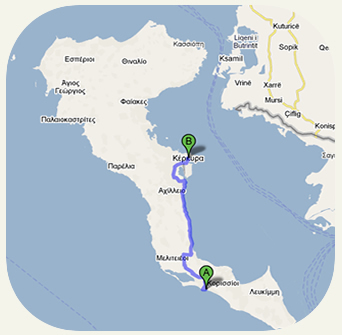 As you can see in the map, St George is very close to the centre, just 20 Km from the airport and 10 Km from Kavos which is close to us. In St George you can use the public transport or rent a car or a bike and make a tour of our island, visiting the sights. The holiday resort St. George Argirades in Corfu caters for your night life as well, since there are plenty of tavernas, luxurious restaurants, clubs, discos. You can have a wonderful time in places like «Oh Lala» club in which a lot of events happen every night!